2012 continues with a bang for Flux Delux as we welcome Johan Ekman back for a series of scheduled releases and remixes across the Recoverworld labels. Starting with this exciting 2 track E.P. Johan delivers big room trance of the highest quality as he seamlessly blends stylish melodies and lead lines with plenty of drive and bottom end punch. 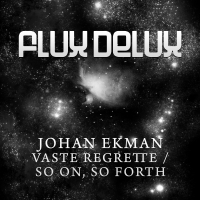 'Vaste Regrette / So On, So Forth' is available now from Beatport and iTunes.